Comments: Coyotes are incredibly adaptable and are found in nearly all habitats of North America. They live alone, in pairs or packs. Home ranges can be as large as 25 square miles. They are vocal and shortly after nightfall may howl to indicate their location, claim their territory, reinforce social bonds or simply because they enjoy howling. Pairs sometimes mate for life. Their den sites include cavities under rock ledges, hollow logs, shrub thickets and dens abandoned by other mammals. They may use several dens when rearing pups. Litters of 4-7 pups are born in spring. They can live up to 10 years in the wild. Distribution: Coyotes range from South America through Alaska. They occupy all habitats in Kansas. 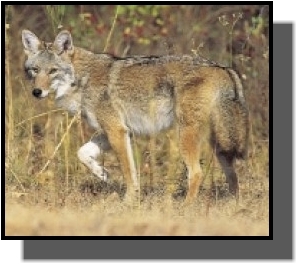 Food: Coyotes hunt from dusk to dawn for rabbits, mice, rats, squirrels and ground nesting birds. They also eat plant matter, including fruits and berries. They will scavenge dead livestock and kill poultry, small livestock, cats and small dogs. Urban Coyotes: Some excellent research on the natural history and behavior of urban coyotes in available at Ohio State University.